Anse de Pitons is a fabulous crescent shaped beach overlooking the Pitons. The white sand, clarity of the water, and stunning setting between the twin Gros and Petit Piton volcanic peaks make this beach south of Soufrière a favourite spot for swimming and sunbathing. 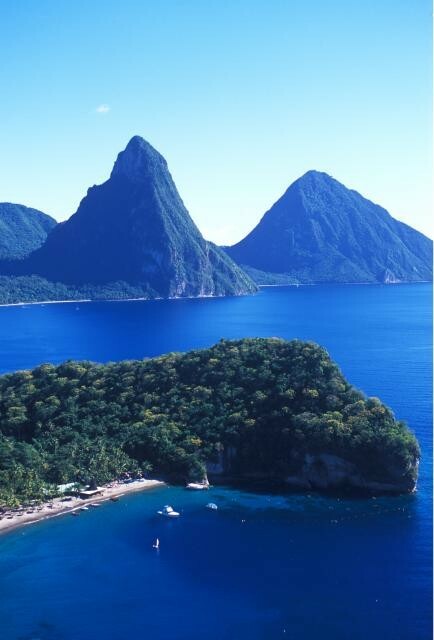 Snorkelers and scuba divers come for the adventures to be had at the 1,800-foot drop off at the base of the Pitons. Access to the beach is either by boat or through the grounds of the 5 star Jalouise Saint Lucia hotel. Anse Chastanet is located just north of Soufrière and is a picture postcard beach with 1 mile of soft, white sand fringed by gently swaying palms and lapped by warm crystal clear blue water. With a sharp drop off, coral reef and sea walls, this beach affords snorkelers and divers many opportunities for viewing the vivid ocean life without ferrying out to deeper waters by boat. The natural sand reflects the volcanic origins of the island. Soufrière itself has a stretch of dark sandy beach fringed with coconut palms to the north of the town which is particularly popular with locals. 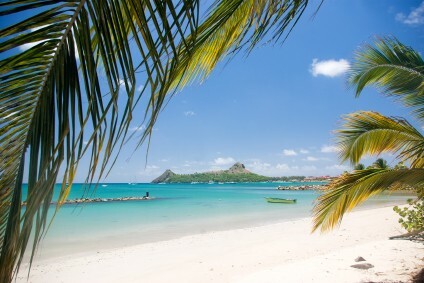 On the northwest coast, the popular Marigot Bay is home to another spectacular beach. The bay itself is surrounded on three sides by forested hills and there are a number of restaurants, bars, cafes and shops nearby. There is also an inlet close by which is really secluded and peaceful. Choc Bay is a sweeping sandy bay near Castries. The calm waters make it a great place for families with children and there is excellent natural shade underneath the palm trees for the hottest parts of the day. 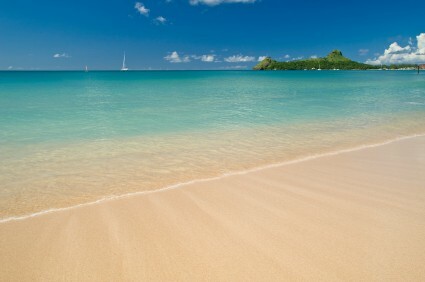 Reduit Bay together with Rodney Bay are St Lucia’s main beach areas. There are several bars, restaurants and an excellent selection of water sports available. For the most part, St. Lucian beaches are relatively short, but with five miles of white sand on Rodney Bay, Reduit is the place for a long stroll by the shore and a swim in calm waters. One of the most popular beaches on the island, it is fronted by the Rex St Lucian Papillon and the Royal St Lucian hotels. Anse des Sables is located on the south Coast of St Lucia and is a very accessible sandy beach with stunning views of the Maria Islands. It is windier on this side of St Lucia and as a result it is very popular with surfers and wind surfers. But is also an excellent beach for sunning as it is so beautiful. Pigeon Island is both an historic landmark and a very popular recreation area. Quiet and secluded, this beach on the north end of the island is the place to combine sunning and swimming with a visit to a mini-museum and a climb to a vantage point to see the historic Fort Rodney ruins and views of the distant island of Martinique. There are also two restaurants close by. Jalousie beach is one mile long located right between Gros Piton and Petit Piton. The water is crystal clear and almost always calm and wonderful for swimming. Soon to become part of a new national park, this mile long stretch of beach north of Dennery is set against a backdrop of cliffs in an area that was once a plantation. Now, visitors come for Turtle Watch, where they can see the natural wonder of endangered leatherbacks (think Crush from “Finding Nemo”), the largest of sea turtles, heaving themselves out of the water and onto the beach to lay their eggs.